Kilburn Castle is part of a 'country park" -- a strange sort of amusement park/picnic area/public park that is so common here. The estates are full of acitivities for kids, walking paths, beautiful gardens, all open to the public. We have been a bit leery of this sort of offering after Happy Bunratty Land in Ireland, where we felt like oddly dressed extras in a low-budget film. When we saw signs to the "Magic Forest" and "Fairy Mound" and the parked caravans, we were a bit nervous; when we glimpsed the gaudily painted castle itself, we bolted for greener pastures. This isn't an avant-garde art display - it's part of the effort to raise money to reharl the castle and perform restoration work. It's still quite startling, though. THe concrete coating that replaced the original harling is damaging the stone walls and needs to be replaced. It was at that point that the current Earl of Glasgow invited graffiti artists to paint the walls prior to the repairs (which, hopefully, will commence soon). The castle is a large Z-plan tower house dating from 1581, attached to a large, more-modern mansion. It is possible that some parts of the buildings date from the 12th and 13th century, no substnatial remains are still standing. The nain tower is 16m x 8m (rather narrow!) and the towers are 4.4m in diamter. The tower has four storeys and has round towers on opposite corners - one painted like a giant nutcracker. The twller tower contains the main staircase. The additional buildings date from the various extensions - 1700, 1722, and at the end of the 19th century, when the house was added and updated.It is attached only tangentially to the main tower, and possibly replaced an earlier 17th century block. 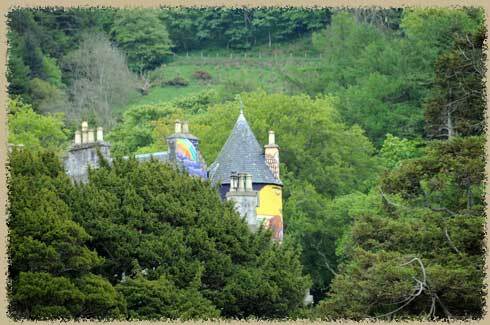 THe lands of Kelburn belongs to the Boyles in the 12th century. They became Lord Boyle in 1699 and Earls of Glasgow and Viscounts Kelburn in 1703 for their part in resolving the Jacobite risings and the Acts of Union. The family still lives in the castle -- making the castle here a rival with Traquair for the oldest continuously occupied castle in Scotland, and is the oldest house continuously occupied by one family.